PART-TIME COMPETITIVE Standard & Latin International Program. 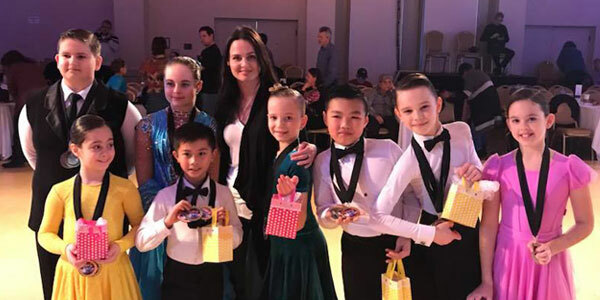 For dance couples interested in a part-time competitive aspect of ballroom dancing we offer professional dance instruction for amateur couples, kids, and teenagers. We offer a part- time competitive dance program for students who demonstrate a passion for dance and wish to build on their skills with a more advanced curriculum. These classes provide challenging environment that will motivate dancers to work harder and give their best effort. The skills learned in this program have proven to be valuable life lessons that continue to benefit the students in all career choices. Self-discipline, self-expression, responsibility, and time management are only some of the qualities that our students are guaranteed to acquire. CLASSES: 3-4 group classes a week. 1-2 Private lessons a week. DANCERS MAY COMPETE: at Interclub DNL Festivals, local competitions and some US competitions. *Students always can upgrade program if they feel that they need more hours per week.